Because the bones making up the human skeleton are inside the body, the skeleton is called an endoskeleton ( endo means "within"). In animals that have an external skeleton, such as the crab, the skeleton is called an exoskeleton ( exo means "outside"). Exoskeletons restrict the movement of an organism and must be shed periodically in order for that organism to grow. Endoskeletons allow for freer movement and grow along with an organism. All humans are born with over 300 bones. As an individual ages, certain bones (such as those in the skull and lower spine) fuse or join together, thereby reducing the number. By the time an individual reaches adulthood, the number of bones in the body totals about 206. Bone is living tissue that is constantly being renewed throughout life. Three types of bone cells take part in this process: osteoblasts, osteocytes, and osteoclasts ( osteon is the Greek word meaning "bone"). Osteoblasts are the principal bone-building cells. They produce hard calcium compounds and flexible collagen (a fibrous protein), which combined form the nonliving part of bone called the bone matrix. The matrix makes bone strong, hard, and slightly elastic. In the process of forming the bone matrix, osteoblasts become trapped in it. Once they are trapped, they develop into osteocytes or mature bone cells. Osteocytes help maintain the hard bone tissue by removing and replacing the calcium compounds in the matrix. In mature adults (whose bones are no longer growing), osteocytes are the most numerous bone cells. Finally, osteoclasts are the bone-destroying cells. They break down bone matrix, releasing calcium and phosphate ions into the blood (this is important when blood calcium levels drop below normal). Portion of the skeleton consisting of the pectoral girdle, the pelvic girdle, and the bones of the arms and legs. Portion of the skeleton consisting of the skull, vertebral column, and rib cage. Sac filled with synovial fluid that decreases friction between a tendon and a bone. Shaft of a long bone containing a narrow canal filled with yellow bone marrow. Also known as soft spots, fibrous connective tissue between flat bones in the developing cranium. Area where adjacent bones meet or articulate. Fibrous connective tissue that connects bone to bone. Large cells that break down bone matrix. Dense fibrous membrane covering the surface of bones except at the joints. Connective tissue membrane that lines joint cavities and secretes synovial fluid. Tough, white, cordlike tissue that attaches muscle to bone. has been replaced, usually by the time an individual reaches the end of puberty (cartilage remains at the ends of bones to prevent wear and tear). Bones may be classified according to their various traits, such as shape and texture. Four types are recognized based on shape. These are long bones, short bones, flat bones, and irregular bones. Long bones are found in the extremities: the arms, legs, hands, and feet (but not the wrists or ankles). As their name indicates, long bones have a long central shaft with knobby end portions. The shaft is called the diaphysis and each end is called the epiphysis. Short bones, which are cube-shaped, are found in confined spaces such as the wrist and ankle. Flat bones are thin and wide, providing surfaces for muscle attachment and protection for underlying organs. The ribs, shoulder blades, sternum (breastbone), pelvis (hips), and most of the bones of the skull are consider flat bones. Irregular bones are those that do not fit into the first three categories. Vertebrae (bones of the spinal column) and facial bones are types of irregular bones. connective tissue, the periosteum contains nerves and blood vessels. Underneath the periosteum lie two different types of bone tissue: compact bone and spongy (or cancellous) bone. Although dense and smooth, compact bone is filled with numerous microscopic passageways carrying nerves, blood vessels, and other structures that provide living bone cells with nutrients. Spongy bone has a lacy network of bone tissue with many cavities, making it look like a sponge. Although lighter in weight than compact bone, spongy bone is nearly as strong. The diaphyses of long bones are made of compact bone with a hollow center that forms a canal. That canal is filled with yellow bone marrow, which is mostly adipose or fatty tissue. The epiphyses of long bones consist of spongy bone covered with a thin layer of compact bone. Yellow bone marrow also fills the cavities of spongy bone in long bones. Short, flat, and irregular bones are all made of spongy bone covered by a thin layer of compact bone. The cavities of the spongy bone in these bones are filled with red bone marrow, which is the loose connective tissue that produces blood cells in certain bones. In adults, red blood cells, five types of white blood cells, and platelets are formed in the red bone marrow of portions of the ribs, vertebrae, sternum, and pelvis. The bones forming the human skeletal system are divided into two divisions: the axial skeleton and the appendicular skeleton. The axial skeleton includes bones associated with the body's main axis—the spine. This includes the skull, the spine or vertebral column, and the rib cage. The appendicular skeleton is attached to the axial skeleton and consists of the bones associated with the body's appendages—the arms and legs. This includes the bones of the pectoral girdle (shoulder area), the arms, the pelvic girdle (hip area), and the legs. Please note: in the naming of the major bones of the body on the following pages, pronunciations are provided in parenthesis when necessary. 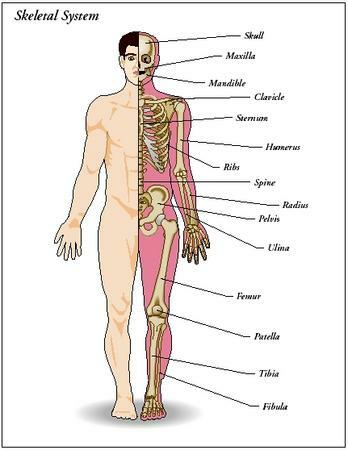 Over half of the bones in the body are located in the arms and legs—120 bones. The hyoid bone in the throat is the only bone that does not touch another bone. It is usually broken when a person is hanged or strangled, and therefore will often figure in trials concerning such crimes. The longest and strongest bone in the body is the femur. The clavicle (collar bone) is one of the most frequently fractured bones in the body. Fractured clavicles are caused either by a direct blow or a transmitted force resulting from a fall on an outstretched arm. The smallest bones in the body are the three bones found in each middle ear, collectively known as the ossicles (OS-si-kuls). The skeleton of an average person accounts for about 20 percent of total body weight. THE SKULL. The skull consists of two sets of bones: cranial bones and facial bones. In addition to protecting the brain, these bones protect and support the organs responsible for sight, hearing, smell, and taste. 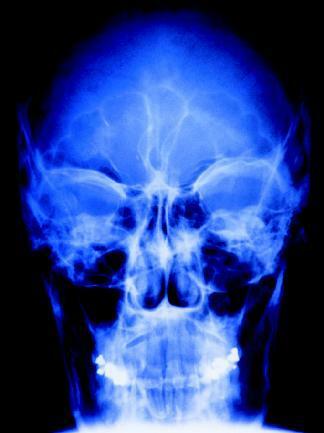 The eight bones of the cranium (the part of the skull that encloses the brain) are thin and flat. Interlocking at their joints, they are immovable. The frontal bone forms the forehead and the upper part of the eye sockets. The two parietal (pah-RYE-ah-tul) bones form the sides and upper portion of the cranium. Lying underneath the parietal bones are the two temporal bones. The occipital (ok-SIP-i-tal) bone forms the back of the cranium. In infants, fibrous connective tissue fills the spaces between the cranial bones. Known as fontanels or soft spots, these spaces allow the skull bones to move slightly during birth. This makes birth easier and helps prevent skull fractures. Eventually, the fontanels are replaced by bone by the age of eighteen to twenty-four months. Fourteen bones compose the face. Of these bones, only the mandible (MAN-di-buhl) or lower jaw is movable. It houses the lower set of teeth. The upper jaw, the maxilla (MAK-sill-lah), is formed by the fusion of two bones. The maxilla also forms the inner lower portion of the eye sockets and houses the upper set of teeth. The two zygomatic (zie-go-MA-tik) bones are commonly called the cheekbones. They also form the outer lower portion of the eye sockets. Certain facial bones contain hollow, air-filled spaces known as sinuses. The main functions of the sinuses are to lighten the skull and to provide resonance (sound quality) for the voice. The sinuses in the bones that surround the nasal cavity are called the paranasal sinuses. They are lined with mucous membrane. The mucus produced in the sinuses drains into the nasal cavity to help moisturize and warm air as it flows into the respiratory tract. Infections occurring in the nasal sinuses tend to move into the paranasal sinuses, causing a condition known as sinusitis. No. Only one joint can occur at an area where bones come together. People who can move their bones beyond normal range are able to do so because the ligaments attached to those particular bones can stretch farther than normal. Contortionists have "stretchy" ligaments, not "double joints." A few bones are not considered a part of the bones of the skull, but are associated with them. These include the bones of the middle ear and the hyoid (HI-oid) bone. Within each middle ear cavity are three auditory bones. They aid the hearing process by transmitting vibrations from the ear drum to receptors in the inner ear (for a further discussion of this process, see chapter 12). The hyoid bone is the only bone in the body that does not attach directly to any other bone. Horseshoe-shaped, it is suspended by ligaments (cords of fibrous tissue that connects bones) from the lower portions of the temporal bones. It lies in the neck about 1 inch (2.5 centimeters) above the larynx (voice box). The hyoid plays a major role in swallowing, supporting the tongue and larynx. VERTEBRAL COLUMN. The skull rests atop the vertebral column, which encloses the spinal cord. Also called the spine or backbone, the vertebral column protects the spinal cord and helps to support the weight of the body, transmitting that weight to the lower limbs. It also provides attachment sites for the ribs as well as the muscles that move the trunk (main part of the body). The individual bones making up the column are collectively called vertebrae (VER-te-bray). A single bone is called a vertebra (VER-te-brah). Before birth, thirty-three vertebrae compose the vertebral column. The nine lower vertebrae eventually fuse, forming the sacrum (SAY-krum) and the coccyx (KOK-siks). The sacrum is formed by the fusing of the first five of those nine vertebrae; the coccyx is formed by the fusing of the last four. The coccyx, or tailbone, is a remnant of the tail other vertebrate animals have. The remaining twenty-four vertebrae are divided into regions based on their structure. The initial seven bones under the skull are referred to as cervical (SIR-vi-kul) vertebrae. They form the neck region of the spine. The first cervical vertebra is called the atlas (in Greek mythology, Atlas was a Titan who was forced by the gods to support the sky on his shoulders for eternity). Its special shape supports the skull and allows the head to nod "yes". The second cervical vertebra is called the axis. It acts as a pivot for the atlas (and skull) above. The twelve vertebrae below the cervical vertebrae are called the thoracic (thuh-RA-sik) vertebrae. The next five vertebrae are the lumbar vertebrae. The sacrum and coccyx then form the end of the vertebral column. The vertebrae sit on top of each other to form the vertebral column. Although vertebrae in each region differ from each other, all vertebrae have the same basic structure. Each has a round body that bears the weight of the column. Discs of flexible cartilage lie between the bodies of vertebrae to provide cushioning, like shock absorbers. In a young person, the discs are about 90 percent water and are spongy and compressible. As a person ages, the water content decreases, and the discs become harder and less compressible. Processes or projections extending out from the bodies toward the back of the human body form a canal through which the spinal cord passes. The processes also allow the vertebrae to interlock with each other and serve as sites for muscle and ligament attachment. The vertebral column is not rigid, but is capable of limited movement such as bending and some twisting. It is also not a straight structure. It has four major curves, forming a long S. This adds strength to the column, increasing the skeleton's balance and ability to hold the body upright. The out-ward curves (toward the back of the body) of the thoracic and sacral regions are known as primary curves because they are present at birth. The inward curves (toward the front of the body) of the cervical and lumbar regions develop when a baby begins to raise his or her head (cervical) and when the baby begins to walk (lumbar). By the time a child is ten years old, all four spinal curves are fully developed. THE RIB CAGE. Twelve pairs of ribs (a total of twenty-four bones) extend forward from the thoracic vertebrae. Most of the ribs (the first seven pairs) attach in the front of the body by cartilage called costal cartilage to the long, flat sternum (STIR-num) or breastbone. These ribs are called true ribs. The next five pair of ribs are called false ribs. The first three pair of false ribs do not attach directly to the sternum, but to the costal cartilage of the seventh pair of ribs. The lower two pair of ribs of false ribs, also called floating ribs, do not attach to the sternum at all. Ribs give shape to the chest and support and protect the body's major organs, such as the heart and lungs. 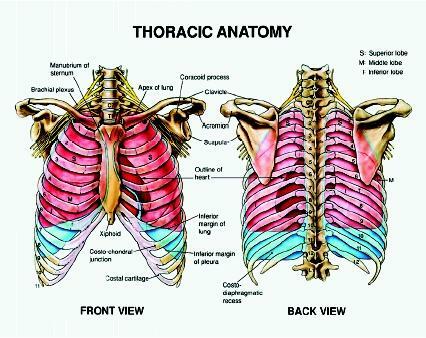 The rib cage, formed by the ribs and sternum, also provides attachment points for connective tissue, to help hold organs in place. THE PECTORAL GIRDLE. Forming a loose attachment with the sternum is the pectoral girdle, or shoulder. Each shoulder is formed by two bones: the scapula (SKAP-yoo-lah) or shoulder blade and the clavicle (KLAV-i-kul) or collar bone. The large triangular-shaped scapula anchors some of the muscles that move the upper arm. The S-shaped clavicle is small and light and relatively fragile. Each clavicle acts as a brace for its corresponding scapula, preventing the shoulder from coming too far forward. The major advantage to the loose attachment of the pectoral girdle is that it allows for a wide range of shoulder motions and greater overall freedom of movement. THE ARMS. Each arm or upper limb (composed of the upper arm, forearm, wrist, and hand) contains thirty bones. The upper arm contains only one bone, the humerus (HYOO-mer-us), which extends from the shoulder joint to the elbow joint. At the elbow joint, the humerus articulates or connects with the two bones of the forearm, the radius (RAY-dee-us) and the ulna (UL-na). When the arm is held out and palm faces upward, the radius and ulna are parallel to each other; the radius is on the thumb side and the ulna is on the little finger side. When the arm is turned over and the palm faces downward, the radius crosses on top of the ulna to form an X. Each wrist is composed of eight bones known as carpal (CAR-pal) bones. They are arranged in two irregular rows of four bones each. Ligaments bind the carpals together, restricting their movement. Nineteen bones form each hand. The bones forming the framework of the palm, which articulate with the carpals, are the five metacarpals (mehtah-CAR-pals). In turn, the metacarpals articulate with the fourteen finger bones or phalanges (fah-LAN-jees). The thumb has two phalanges, while the four fingers each have three. When a person pulls quickly on his or her finger, a vacuum is created in the joint cavity between the phalanges, displacing the synovial fluid normally found in the cavity. The popping sound occurs when the fluid rushes back into the cavity. THE PELVIC GIRDLE. Unlike the pectoral girdle, the pelvic girdle is strong and dense. It consists of two large coxal (KOK-sal) or hip bones. Each coxal bone, left and right, consists of three fused bones—the ilium (ILL-ee-yum), the ischium (ISH-ee-um), and the pubis (PEW-bis). The ilium is the flared, upper portion of a hip. Each ilium attaches at the rear to the sacrum, connecting the pelvic girdle to the vertebral column. The ischium is the ring-shaped lower part on which a person sits, and the pubis is the most forward portion at the bottom of a hip. These three bones generally have fused together by the time an individual reaches adolescence. The pelvic girdle is bowl-shaped, with an opening at the bottom ( pelvis is the Latin word meaning "basin"). In a pregnant woman, this bony opening is a passageway through which her baby must pass during birth. The pelvic girdle of women is generally wider than that of men, which helps to ease birth. The pelvic girdle protects the lower abdominal organs, such as the intestines, and helps support the weight of the body above it. THE LEGS. Each leg or lower limb is similar in form to an arm or upper limb. Each leg (composed of the thigh, lower leg, and foot) also contains thirty bones. The thigh contains only one bone, the femur (FEE-mur), which extends from the hip joint to the knee joint. The bones of the lower limbs are thicker and stronger than the bones of the upper limbs. In fact, the femur is the longest, strongest, and heaviest bone in the body. As it runs down the upper part of the leg, the femur slants inward. This helps bring the knees in line with the body's center of gravity. The patella (pah-TELL-ah) or kneecap is a thick, flat, triangular-shaped bone that lies above and protects the knee joint. At that joint, the femur articulates with the larger of the two bones of the lower leg, the tibia (TI-bee-ah) or shinbone. The fibula (FI-byoo-lah), which lies along the outer side of the tibia, is slender and sticklike. It has no part in forming the knee joint, but provides a surface for muscle attachment and helps keep the ankle bones from sliding laterally (side to side). The inner and outer bulges at the ankle are formed by the ends of the tibia (the inner bulge) and fibula (the outer bulge). 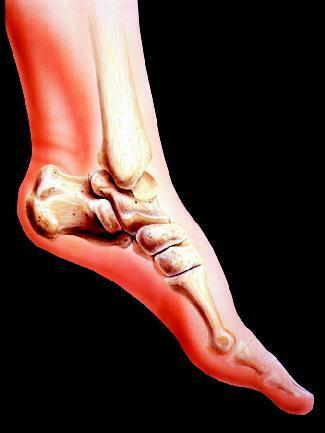 At the ankle joint, the tibia and fibula articulate with the seven tarsal (TAR-sal) bones forming the ankle and heel. The weight of the body is mostly carried by the two largest tarsals: the calcaneus (kal-KAY-nee-us) or heel bone and the talus (TAL-us), which lies between the tibia and fibula. As in each hand, nineteen bones form each foot. The bones forming the framework of the sole, which articulate with the tarsals, are the five metatarsals (meh-tah-TAR-sals). In turn, the metatarsals articulate with the fourteen toe bones or phalanges (fah-LAN-jees). 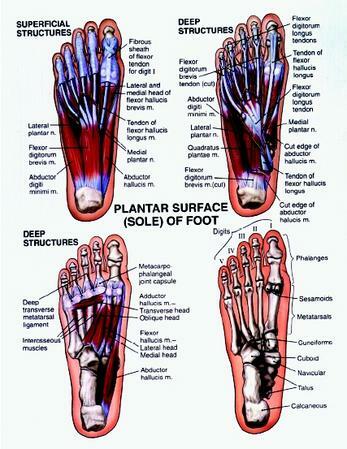 There are two phalanges in the big toe and three in each of the other toes. Two types of dense connective or fibrous tissue are attached to bones—ligaments and tendons. Ligaments fasten bone to bone at joints, wrapping around the joints to hold the bones together. By doing so, they make joints more stable. Depending on their location in the body, they can be shaped like a thick strap, a rope, or a flat ribbon or bandage. Because they are bundles containing elastic fibers as well as collagen fibers, ligaments can stretch to a certain degree. Tendons attach skeletal muscles to bone. A tendon is the tough, white, cordlike tissue that is formed when the layers of connective tissue that bundle the various parts of a muscle converge or come together at the end of the muscle. Tendons contain fibers of the tough protein collagen, but they cannot stretch as much as ligaments. Tendons are much stronger than muscle tissue. As muscles are used, the tendons are able to withstand the constant pulling and tugging of the muscles on the bones.